NEW YORK CITY — Forty-eight people were fatally struck by subways in 2016... in the Stations! Is Death by subway in New York tolerable? Yet the New York subways remain open, as they have been for decades, as if it is just "par for the course" that 50 people are going to die every year while standing in a subway station in NY, and yet it remains operative... Every year somebody is going to trip, or bump another person, or get bumped onto a track when a train arrives. What about the designers of the subway in New York? Plenty of decades-old blame there, but I guess it is acceptable to talk now of "reductions" in deaths, we are so used to it, rather than talk about how unsafe the subway platforms actually are, and why are we accepting of this for so long? The NY subway lacks proper safety compared to even the so-called "developing" country of China where their subways have glass walls with doors separating peds from trains to prevent this sort of thing. Yet, the NY subway still runs every day, show must go on, despite the huge safety flaws. This amazes me, the inconsistency of concern over human life, depending on in what part of our transportation system it took place. Meet they guy just hired to fix it. Here is to hoping that his first priority is given to SAFETY above all else... 50 dead each year. "Commuters and politicians alike have little affection for their subway — many New Yorkers openly hate it — and they barely pay buses any regard. 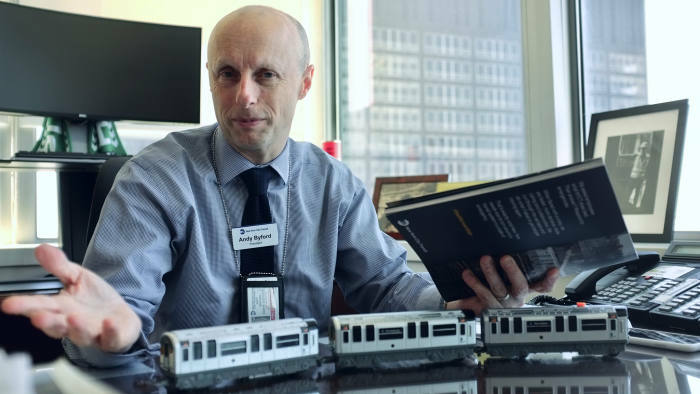 New York’s subway carries more people than London’s, according to some estimates, but Mr Byford’s $325,000 salary is less than that of Mike Brown, commissioner of Transport for London.“Fixing this system is going to need the goodwill of politicians, the funding — but also the patience of New Yorkers,” Mr Byford says.